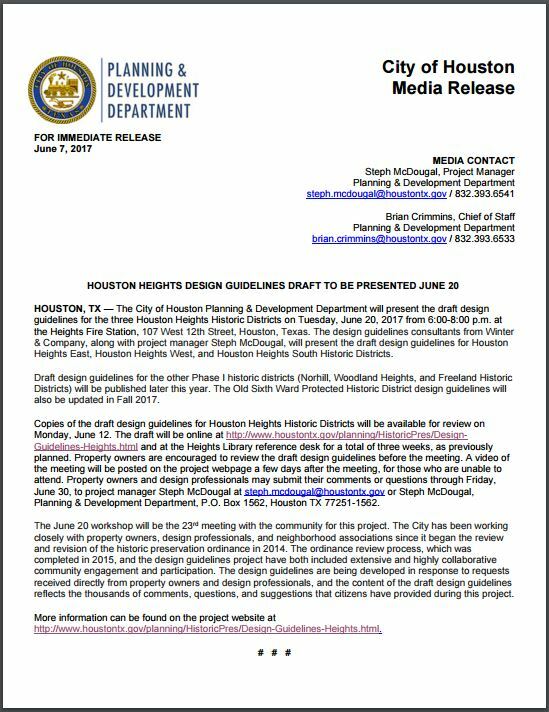 The long awaited Houston Heights Historic Guidelines (draft) will be presented on June 20th, 2017 at the Heights Fire Station. The meeting will be from 6-8 pm at 107 W 12th St., in Houston Height. (Yale at W 12th St). This doesn’t seem like nearly enough time to present something that major, so it should be fast-paced. These initial guidelines will cover Houston Heights East, West and South. The guidelines for Woodland Heights, Norhill and Freeland Historic Districts will be published later this year. See my page on Heights Historic Districts to see district boundaries. 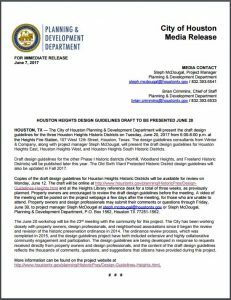 Houston Heights Historic Guidelines News Release. These guidelines have been underway for a long time. Consultants Winter & Company have had interim meetings to get input from Heights residents, builders, remodelers, etc. Project Manager, Steph McDougal will give the details. Steph has always quickly answered questions I had about timelines, etc. so I expect an impressive proposal. It is impossible to make everyone happy, so regardless how these guideline turn out, they are going to piss off somebody. There are people who are unhappy with any change: “Keep the little bungalows and don’t change the character of the neighborhood.” There are also those who want to build an addition onto their little bungalow. They are cramped in their 1300 SF house and want to add a master suite. A historic renovation by HDT Builders. 1845 Harvard St, in Houston Heights. The old haphazard way of approving renovations/new construction in a historic district had to go away. A homeowner never could be sure of what was allowed or not allowed until the board made a decision. This decision often seemed arbitrary or was the luck of the draw. Everyone has horror stories about this process: One house with a big addition was approved, where an almost identical one was denied. Stucco might be allowed on one house but not the one next to it. Total confusion. For a homeowner it is frustrating; for a builder it is a costly nightmare. Note payments keep ticking away while the builder keeps appearing before one board meeting after another trying to get plans approved. So, we are about to have guidelines. I don’t know how they can answer every conceivable situation in a written guidelines but they have made a heroic effort. We will soon see. The meeting is on the 20th, but the draft guidelines will be available on the 12th. They will available on the city website, as described in this Press Release. Note: The draft of the guidelines have been published. 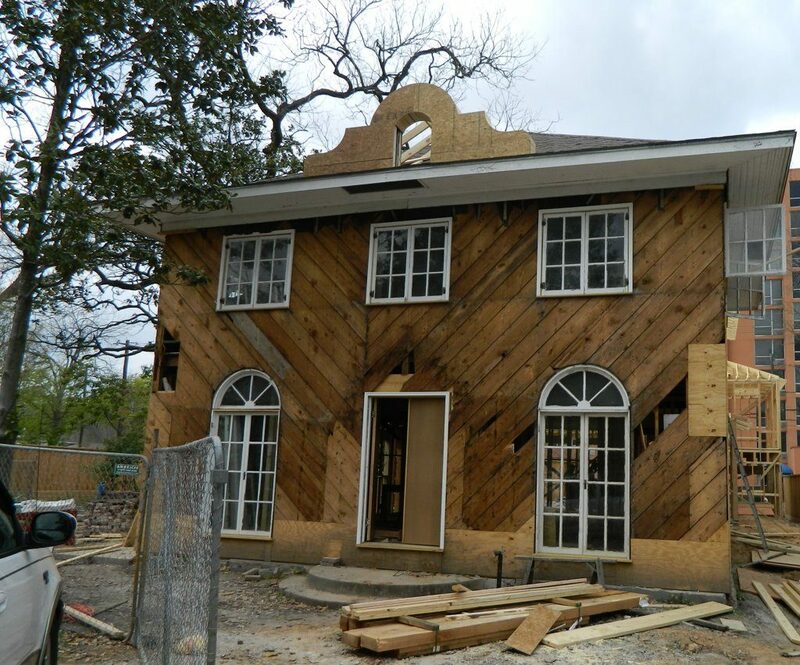 Click here for Houston Heights Preservation Guidelines .